Set on a bluff overlooking the Columbia River approximately 350 feet north of St. Paul's Mission near Kettle Falls, WA is a natural and historic object seeming out of place amidst a landscape of dense Ponderosa pine forest. Large, off black in color, uniquely shaped, and weighing over a ton, the Sharpening Stone is a mute testimonial to a time when the river ran free, its banks were lined with native fisherman. 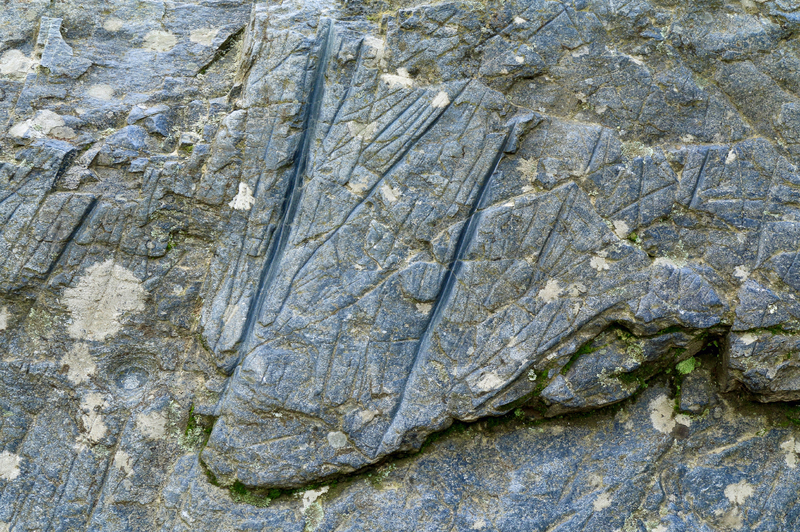 Comprised of amphibolite, the geological composition is more fine-grained than the local bedrock, indicating this boulder is not from this area. 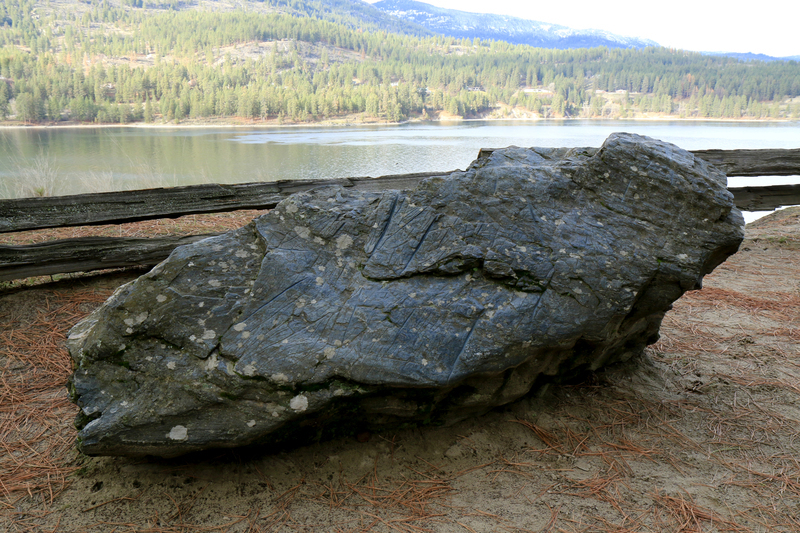 Geologists have two theories of how this boulder came to the bank of the Columbia River. The first is that a large glacier deposited the boulder as it receded. The second is that the massive rock was carried by one of the cataclysmic Ice Age floods that swept through eastern Washington. Below this bluff was the site of a once thunderous and mighty natural spectacle. Kettle Falls was a series of cascades and rapids plummeting over 50 feet within half a mile as the river channeled through two main ledges of massive quartzite boulders, also deposited by the Ice Age floods. A large island split both the river and upper portion of the falls where the falls dropped fifteen feet. The river descended another twenty feet as it reemerged past the island before spilling another twelve to fifteen through a series of rapids making up the lower portion of the falls. 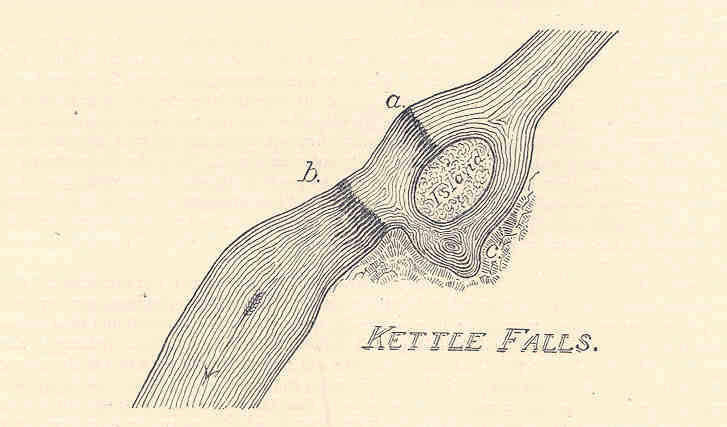 Kettle Falls is named after the English translation French voyageurs who passed through the region during the early nineteenth century called La Chaudière, meaning "boiler" or "kettle." It was noted the effect of the crashing water into the quartzite rock created circular potholes resembling the bottom of a kettle. Some also noted the incredible force produced by the rapids made a boiling effect. The torrential sound generated by the falls could be heard for miles away. For the Interior Salish tribes - the Spokane, the San Poils, and the Colville who thrived on this land for thousands of years, they called the falls Shonitkwu, meaning "roaring" or "noisy waters." Until 1941, Kettle Falls was also the site of another one of nature's most beautiful spectacles. Every year from June to October millions of Chinook, Coho, pink, chum, and sockeye salmon, some as far away as Alaska, made the journey to the Columbia River to spawn at the places of their birth at the end of their natural lives. Kettle Falls was one of the first natural barriers on the river as salmon had to leap the rapids in order to proceed further. 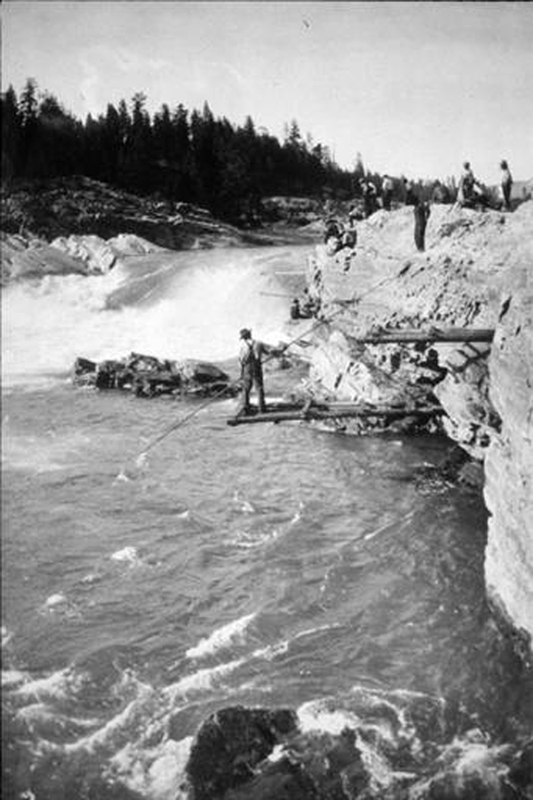 For the Interior Salish, the lower end of the falls served as a natural fishery. As many as 10,000 natives would gather each year, from dozens of tribes, to catch and dry salmon. The natives used the "Sharpening Stone" as a whetting stone to hone harpoon and spear points to catch salmon. The grooves and notches from centuries ago can today be seen on the boulder's surface. The tribal chief would perform a dance to commemorate the salmon hunt. Along the bank and boulders splitting the rapids, the men placed platforms and J-shaped woven baskets (Ilth Koy Ape in Salish) to catch the leaping fish. The women would place the catch along the bank to dry before being filleted and distributed to families. The natives also allowed some of the salmon to pass through the falls so the cycle could continue the following year. In addition, the natives also caught steelhead and fish to add to their subsistence diet. While the area of Kettle Falls was on land belonging to the Interior Salish tribes, salmon was inclusive for all native Americans who partook in the salmon hunt, including those from far away. From the north, the Sinixt (Lake Arrow People) and the Okanogan came while the Cayuse and other Plateau tribes came from the south. To the west came the Coastal Salish tribes who lived along the Washington Coast and Puget South while to the east the Coeur d'Alene, Nez Perce, Kalispel, and other Plains tribes from Montana made the annual migration to the falls. Any member from any tribe could hone their spear points into the "Sharpening Stone" and partake in the salmon hunt. The convergence of various tribes meant Kettle Falls was also a lively and seasonal trading center. Items such as coastal beads, camas, buffalo hides, horses, weapons, pelts, and much more all passed through this area. However by 1941, the landscape of Kettle Falls changed dramatically. The completion of the Grand Coulee Dam created the Lake Roosevelt reservoir, thereby inundating the falls under 90 feet of water. 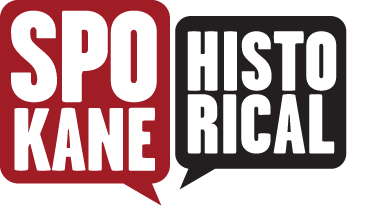 All along the reservoir, Native American sites and towns built in the late nineteenth century also became flooded. Dams built along the Columbia River, including Grand Coulee, severely dwindled salmon populations for generations. The original location of the "Sharpening Stone" was just off the bank at the lower falls. As an act of preservation, tribal members in 1940 chose to relocated the boulder to its present location where not only is it a record to a way of life gone forever but to preserve 9,000 years of Native American heritage at this site. Adrienne Sadlo, “The Sharpening Stone,” Spokane Historical, accessed April 20, 2019, https://spokanehistorical.org/items/show/658. B.W. Evermann, "Bulletin of the United States Fish Commission ," in "Papers on Pacific Salmon," Washington, D.C.: U.S Commission of Fish and Fisheries, 1898, 182-85. Cassandra Tate, "Kettle Falls," HistoryLink.org, December 27, 2005, Accessed November 1, 2016, http://www.historylink.org/File/7577. Kit Oldham, "David Thompson Party Reaches Kettle Falls on the Columbia River on June 19, 1811," HistoryLink.org, January 23, 2003, Accessed November 4, 2016, http://www.historylink.org/File/5102. Robert H. Ruby & John Brown, The Spokane Indians: Children of the Sun, expanded ed., Norman, OK: University of Oklahoma, 2006, 16-19. Robin Cody, Voyage of a Summer Sun: Canoeing the Columbia River, Seattle: Sasquatch, 1995, 122-23.